That’s right ladies and gents, the Queen has returned to the side of her King. Stephanie McMahon is back! She wasted no time in asserting her authority as she addressed the WWE Universe. She and Triple H reigned adulation on the deserving WWE World Heavyweight Champion Seth Rollins for successfully defending his title against 3 other men in a Fatal Four Way. Rollins had more than proved that he was worth their investment as the future of the WWE and they informed the faithful and dissenters alike that later that night, they would pay tribute to our beloved champion. They would have a presentation of Seth Rollins: Architect of a Dream. And speaking of titles… Stephanie thanked Daniel Bryan for admitting that she was right and for doing the right thing as for the second year in a row, he had to vacate a title due to injury (*cough cough* B+ Player *cough cough*) Before she could make any real announcement, the Celtic Warrior, Sheamus came out to the ring. He apologized for interrupting but suggested that since he was the man responsible for putting the goat our of commission that he should just be awarded the title. This brought out Ryback, who disagreed vehemently. Oh yeah… he doesn’t like bullies either. As tensions rose, triple H stepped in the middle and informed both me that they would be facing each other for the IC Title at Elimination Chamber against 4 other men IN the Elimination Chamber. But he was also digging the crazy vibe between the two men and deemed that they would have a match against one another right now! As soon as the WWE’s power couple exited the ring, the match between The Big Guy and the Celtic Warrior was under way. Raw power and strength were the name of the game for Ryback as he took the fight right to Sheamus in a way that the Irishman was not used to. As the Celtic Warrior battled to defend against being thrown around, he began to target the injured ribs of Ryback. 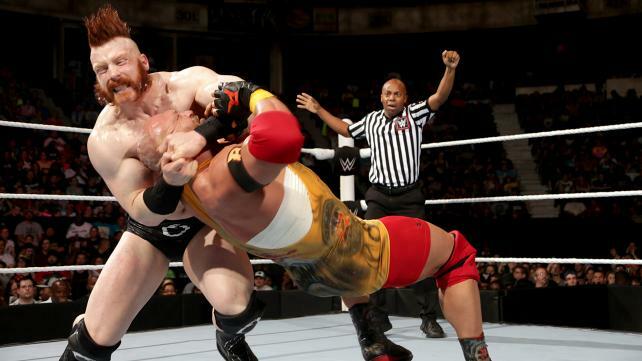 This proved to be a sound strategy as the tides turned and Sheamus began to get in a solid hard hitting offence. But momentum began to shift back into the hungry man’s corner and Sheamus found himself in the corner covering his eye. As the ref pushed Ryback back to exam the injured eye, the Irishman took advantage of the distraction and Brough Kicked Ryback into oblivion to pick up the win. Victory must be healing, because like magic, Sheamus’ eye was good as new much to his and the WWE Universe’s amazement. If this match was any clue as to what we can expect at Elimination Chamber, then the powers that be need to make sure that that thing is reinforced. The power exerted between Sheamus and Ryback was off the charts as both men attempted to beat the other into submission. Both have an extremely powerful offense that is hard to combat and the two of them locked into the monstrosity that is the Elimination Chamber is going to be intense. One almost feels sorry for the other 4 guys… almost. This match between them was brutal and physical does not even begin to describe it. Both display their power and ability. Sheamus though demonstrated a cunning that i’m not convinced Ryback possesses. Considering the win went to the Celtic Warrior and not the Big Guy, kinda makes me see Sheamus as an early favorite in the Intercontinental Championship match. The WWE Universe got the pleasure of hearing from the new sensation, Neville before his match with King Barrett. However, the interview was cut short by Bo Dallas. The situation escalated as the two former NXT rivals came to blows with Dallas targeting the injured knee of Neville before he left the ring to sit in on commentary. Neville’s opponent arrived and as the match got underway, King Barrett wasted no time in targeting the high flier’s knee as well. In a match reminiscent of the evening before at Payback, Barrett and Neville fought bitterly, however Wade had the distinct advantage as he worked to keep Neville grounded. Not that he had to work too hard to defend against the high risk offense. On more than one occasion, as Neville went to use his trade mark abilities, his injured knee would fail him and Barrett would capitalize and keep control of the match. Such a moment happened that allowed Barrett to pick up the win. As Neville attempted to spring board off the ropes, his knee gave out and he crashed to the ring. As he stood, he caught a royal Bull Hammer and was pinned by the 2015 King of the Ring. So it appears that Barrett is moving on from his rivalry with Neville as Bo Dallas enters the picture. The rivalry between the man that gravity forgot and the inspirational Dallas, is something that carries over from their time in NXT as it was Dallas that Neville pinned to begin his record breaking title reign. Barrett was named as one of the six men in the IC Title Elimination Chamber match so that will be fun. Like I said, I hope they reinforce the dang thing. The match between Neville and Barrett was pretty good. The pace was kept at a decent speed that didn’t drag and Bo Dallas on commentary was… well… inspirational. It was a good match to end what was happening between the King and the peasant and send them both off in the new directions. There was a bit of controversy surrounding Rusev’s loss to Cena at Payback. He was screaming in his native tongue while locked in an STF and Lana jumped in insisting that the larger athlete was saying that he quit. The match ended and Rusev was the loser. On Raw, the Bulgarian Brute came down to the ring and insisted that he had not quit and demanded that both Cena and a ref come down to the ring so the match could continue. Lana then appeared and made her way down to the ring. She revealed that Rusev had indeed said “I Quit,” and that she could not just stand there and watch him suffer. She begged his forgiveness for stepping in. Rusev dismissed her silly emotions and then dismissed her stating that she made him weak. He then ordered her to leave. She did. Gotta say saw this coming. How many times has Lana negatively impacted Rusev during a match? I say this was done just in time for him. Now he can concentrate on winning the Intercontinental Championship as he was also named one of the six men to compete in the Elimination Chamber. Good on you Rusev, let go of the dead weight! A bit of deja vu settled over the WWE Universe as it witnessed the match up of Bray Wyatt vs Dean Ambrose. And like those matches from their bitter feud, this one was an amazing array of unorthodox offense from both men and brutality that left one cringing wondering how they would get up from either delivering the move or receiving it. Neither man held on to the offensive advantage for very long as they went blow for blow and countered or reversed the moves thrown at them. Both men took to the air in high risk offense attempts. But it was ultimately Ambrose who began to eek out the advantage. He set Wyatt up for a flying elbow when all of a sudden, J & J Security interfered. While Joey Mercury distract the ref, Jamie Noble flew in from the crowd and pushed the Lunatic Fringe from the top rope and into the waiting arms of the Eater of Worlds who delivered a Sister Abigail to win the match. J & J then joined our beloved champion (who watched the happenings from the stage as he sipped his well deserved celebratory champagne) to gloat about costing the Unstable one his match. The match between Dean and Bray delivered on so many different levels. It picked up the intensity that had made their past matches so intriguing and addictive to watch. Both men put it on the line in an attempt to out do the other one in such a way that would lead to victory. I will say I did not expect J & J to get involved but I am all for it. The prospect of Ambrose and Rollins feuding again makes me happy in ways that should be illegal. Nothing can stop the power of positivity. Not even having Xavier Woods banned from ring side. The Fact Droppers once again took on The New day in WWE Tag Team Championship action. And like the night before it was a fast paced frenzy of team work and high risk offense. But ultimately our champions got a bit over zealous stomping Kidd in the corner and the ref disqualified the champions giving the victory to Cesaro and Tyson Kidd. But the insanity did not stop there. As the beating of the challengers continued, the Lucha Dragons came down to the ring and attacked the champions. But they were followed by Los Matadores, The Ascension and the Prime Time Players who joined the fray. It ended up being the Prime Time Players who stood tall above the other 5 teams. We were later told that these six teams would be the men in the tag team Elimination Chamber match for the WWE Tag Team titles. I expected the match to end in some kinda DQ. No way the New Day would just let their titles be taken after defending them so spectacularly at Payback. What I didn’t expect was the deluge of other teams. It was just fun to see all the teams in short action together. It heights the energy around the Elimination Chamber match and makes it a must see for any one who is a fan of tag team wrestling. This has never been done before and I have one questions… How are they going to fit two men in a pod that is claustrophobic for one man? I don’t know but I do look forward to seeing this match for the tag team titles. Finally a John Cena open challenge that ended as it should. the United States Champion flat on his back attempting to stay conscious. How did this happen? Well Cena came out and blah blahed a bit about the previous night’s match with Rusev. In all honesty I stopped listening and have no real idea what he said till he uttered the words, “if you want some, come get some.” And who should come out? While Owens was not out there to accept the challenge, he was out their to make a statement. The giggle here was the face that thinks it runs the place trying to give Owens “veteran” advice. Kevin shut that nonsense down and warned Cena that while they would not fight that night, that they would eventually fight. And that what he did to Sami Zayn on Wednesday in their match, would be nothing compared to what he would do to Cena. To hammer this promise home, he attacked John and one pop up powerbomb later and the point was made. The WWE Universe would find out later in the night that Kevin Owens would face John Cena in a match at Elimination Chamber in less than 2 weeks. Mark Out Level reached new proportions. I have never before in my life been this excited about a match involving John Cena and it kinda disturbs me a little. But hey, it’s Kevin Owens. He is by far the most dangerous man in NXT and he is just what the doctor ordered to cure the WWE Universe of Cena-itis. Can not wait for this match. If you blinked, you missed this match. How do I know? I blinked and missed this match. Short story made shorter, Dolph wins with a Zig Zag. As he celebrated he was informed that he was named as one of the participants in the Intercontinental Championship match at Elimination Chamber. As he spoke about it, Lana made her way down to the ring. Played coy for a moment then she kissed Dolph. He looked around for a moment (yeah he was looking for Rusev, I would have too…) Then the two kissed again and this brought out the irate Hero of the Russian Federation. It ended with Lana giving her former charge a slap to the face and walking away with the Show Off. So as stated, the match against Stardust was short and not really worth talking about. I wonder what kinda mental frustration this will have on Stardust sense it was a losing streak that turned Cody Rhodes into the Cosmic wonder child. Perhaps it’s what Stardust will need in order to embrace his inner Cody Rhodes? Dolph and Lana paired up makes for an interesting story. But I can’t help but feel as if she is doing it just to make Rusev jealous and by golly bum it is working! Rusev get your head focused boy! leave the blonde bombshell to her petty machinations and concentrate on winning gold. Can anyone say squash match? Who could have thought that these two teams going against one another would be fair? Needless to say, Luke Harper and Erick Rowan destroyed Fandango and Zack Ryder. But so happy that these guys are back together. Wonder if they will follow the buzzards back to Bray? Nikki Bella went against Naomi on her own after Stephanie McMahon insisted that Brie stay behind due to the emotional issues she must be facing due to Daniel Bryan being out for an undermined amount of time. The match between the Diva’s Champion and her challenger was extremely physical for a Diva’s match. I haven’t seen two women try to take each other out with such intensity on the main roster in a long while. I gotta say these two women have stepped up and made main roster Diva’s matches interesting. It was an athletic spectacle that was pretty evenly matched. But it was Nikki who appeared to come out on top setting Naomi up for the Rack Attack. But Tamina jumped in and Super Kicked the Bella Twin’s taste out of her mouth. Naomi and Tamina then ganged up on Nikki and began to deliver a wicked beating. That is until Paige flew to the ring and cleaned house. But before she left, she also delivered a Ram-Paige to the Diva’s champion staking her claim as the true #1 contender for the Diva’s Championship. As stated above this is the first real main roster Diva’s match that was on a similar level to what the NXT Women give us week in and week out. This is what Diva’s Wrestling needs to put out in order to become and stay relevant in the WWE Universe. The addition of Paige to the mix has also done it’s job to add intrigue and the kinda drama the WWE Universe likes to see. More of this please and thank you. And now it is time to pay tribute to the most deserving man in all of the WWE! It is time to honor our beloved champion for all his hard work and dedication and his brilliance as a tactician both in and out of the ring. The victorious Authority paraded the future of the WWE out to the ring and both Stephanie and Triple H showered Seth with the adulation he so rightly deserves. Then it was Kane’s turn. And wile I don’t necessarily by his sincerity, the video montage that he had put together to honor our beloved champion was truly inspiring. Jamie Noble then offered his adoration but before Joey Mercury could speak his gratitude to the champion, the party was crashed by none other than Dean Ambrose. The Lunatic Fringe came down to the ring and once again offered to give Seth a rematch (he had beaten Seth before Payback in order to earn a spot in the Fatal Four way) but only if he put the title on the line at Elimination Chamber. Before Set could decline again (he declined earlier in the night when Dean crashed the party a first time), Stephanie took the mic and berated Dean for his rudeness and told the Unstable one that Seth was not afraid to tear into Dean and teach him a lesson. She then ordered Rollins to take care of Ambrose. Our Champion did indeed go on the attack but The Unstable one some how got the upper hand and dispatched J & J Security and Kane and then took a hold of our champion. 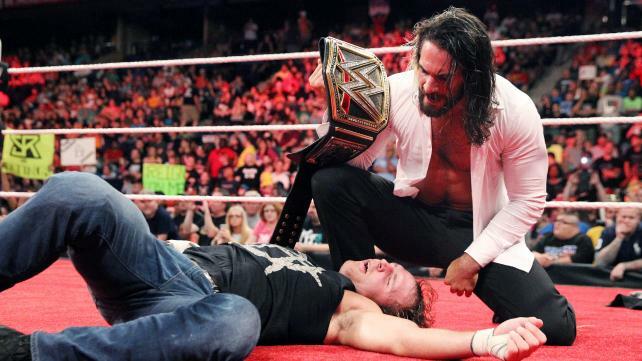 He positioned Seth down on some bricks (who leaves cinder blocks at ring side? Seriously??) and threatened to bash his head with a chair if he was not given what he wanted. A WWE World Heavyweight title match at Elimination Chamber. Stephanie had no choice but to grant the request. It looked as if Ambrose would slam the chair against the head of the savior of the WWE anyway but luckily he was saved by the valiant efforts of the Security team who is tasked with protecting him. This allowed out champion to regain the upper hand and deliver a devastating pedigree to his former business associate and stand tall above him. This entry was posted on Wednesday, May 20th, 2015 at 1:58 pm	and is filed under Events, News, Television. You can follow any responses to this entry through the RSS 2.0 feed. You can skip to the end and leave a response. Pinging is currently not allowed. « Blu-ray Review: ‘Boardwalk Empire’ Complete Series!! Either you're part of the problem or you're part of the solution or you're just part of the landscape.